ABA was selected onto the Design for London Architecture, Landscape and Urban Design Framework Panel. Design for London were looking to appoint framework consultants with ‘vision, creativity and first class design skills ‘ on behalf of the London Development Agency and chose the final 26 firms from a longlist of 185. 1. 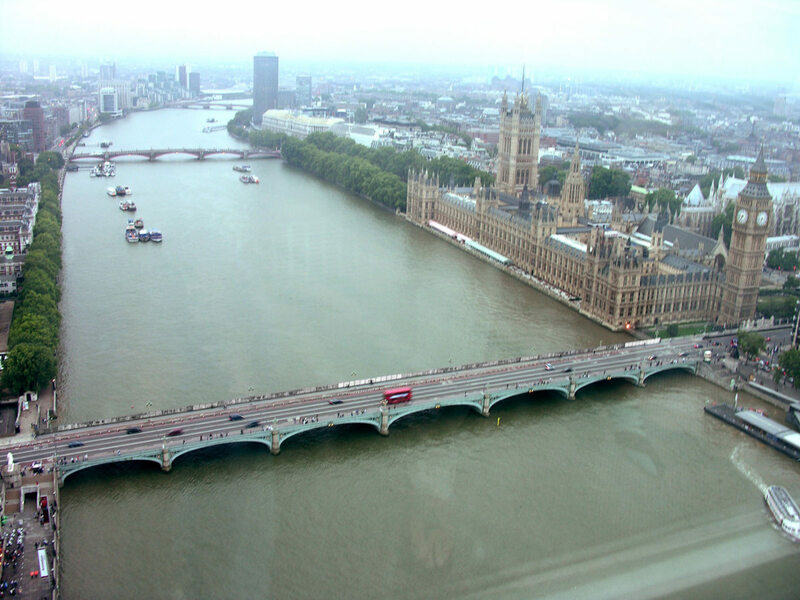 10 islands in the Thames with 20 footbridges connecting north and south sides of the river. 2. Continuous 15km Embankment Park for the north side of the Thames. 3. Re-think and re-design every low grade housing estate in London – one for every architect in the UK. 4. Re-design the North Circular. 5. 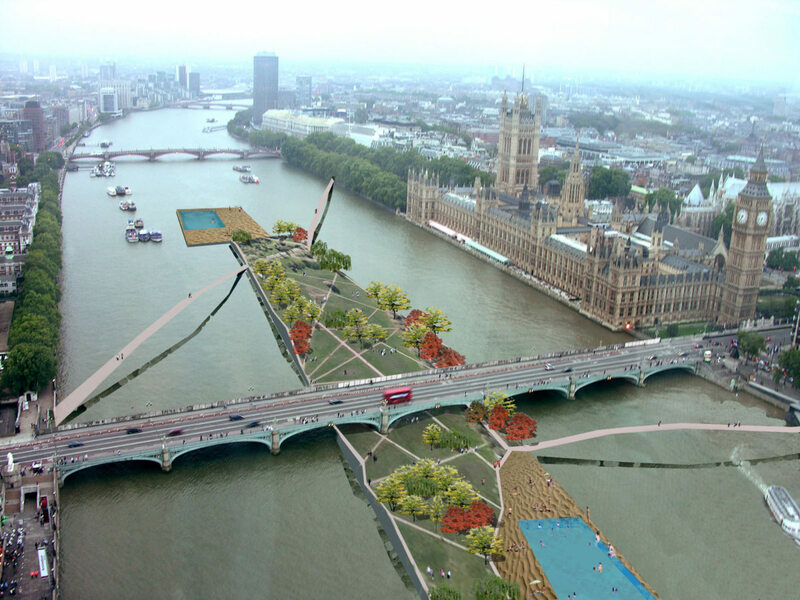 Link every London public/green space with pedestrian and cycle routes. 6. Central ‘no traffic’ zone in West End. 7. Orientation signage embedded in the pavement outside every underground and bus station. 9. Plant trees every 10m along all pavements so no street in London is without trees. 10. Allow cycling in all London Parks. 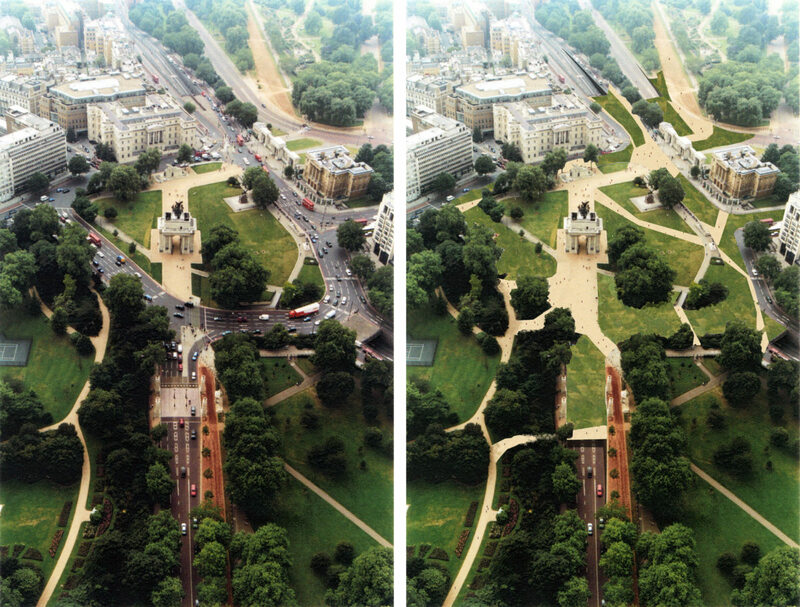 11.Bury roundabout around Hyde Park corner to create continuous park from Notting Hill to Westminster. 12. Allow permanent access to public and cyclists through Horse Guards. 13. Connect Horse Guards to Victoria Embankment across Whitehall with landscaped park. 14. Close Victoria Embankment to traffic along entire route. Run traffic in wide tunnels under linear Riverside Park. 15. Have a dedicated bicycle-only network of roads throughout London. 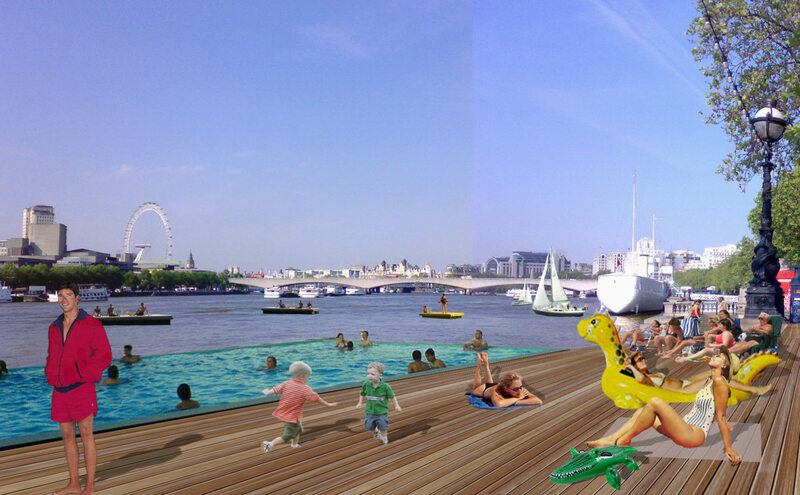 Our submission was among 42 proposals exhibited at Somerset House as part of The London Festival of Architecture.